Have you ever wondered what makes some people into natural mathematicians while others seem to struggle with grasping even basic concepts? 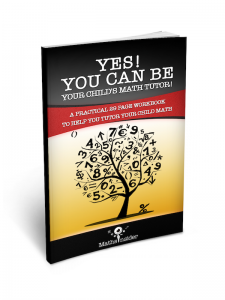 Do you wonder whether there are things you should be doing to help your children reach their potential in math? Here’s my rundown of recent math education research into how we learn, and how best to develop your child’s math skills. 1 Babies’ spatial reasoning predicts later math skills. Stella Lourenco, a psychologist from Emory University conducted a study showing that babies with a stronger interest in a video stream of mirrored images went on to have greater mathematical skill at age four than those with less interest. This may be why some people seem to have a natural aptitude for math, while others find it difficult. The good news is that spatial reasoning can improve with training. Lourenco suggests that an increased focus on this area in early math education could be helpful. Action Point: Provide opportunities to develop spatial skills. Traditional shape sorters, puzzles, and stacking toys are ideal for this. 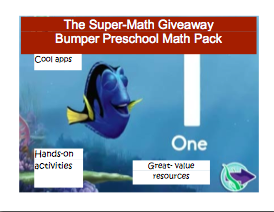 Also, try some of my Short and Sweet Preschool Math Activities. 2 Math difficulties may reflect problems in a crucial learning system in the brain. Procedural memory governs our mastery of non-conscious skills, things like driving. In this research, Tanya M. Evans PhD shows that procedural memory is also important in developing math ability. She suggests that problems with underlying brain structure could be at the root of math difficulties. Action Point: Storytelling can be a great way to support the development of procedural memory. The structure helps children to remember what comes next, setting them in good stead for math concepts later on. 3 Parents’ math skills ‘rub off’ on their children. A recent University of Pittsburgh study shows that we transfer our math skills to our children. Math education researchers found that a child’s performance in standardised tests could be predicted by looking at a parent’s performance in similar examinations. 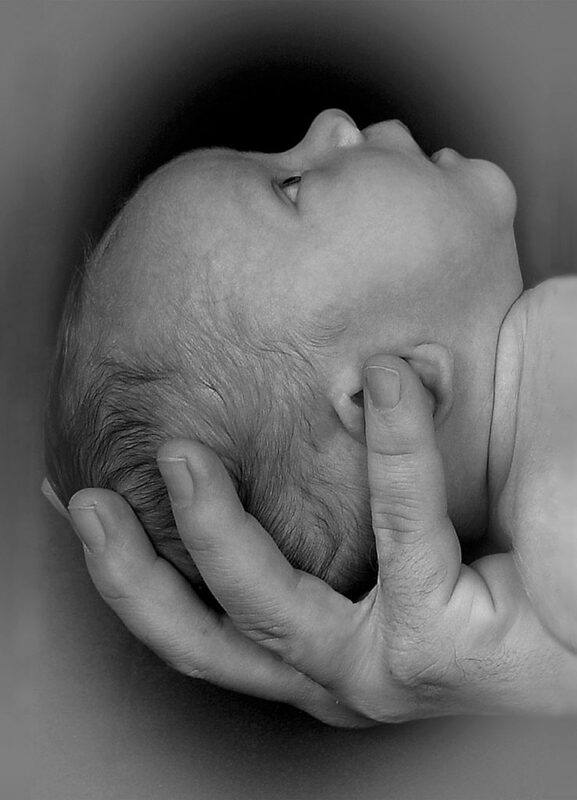 Action Point: Your understanding is key to developing your child’s understanding. If you’re not confident in your own abilities, try Khan Academy or a similar programme to boost your performance in the basics. 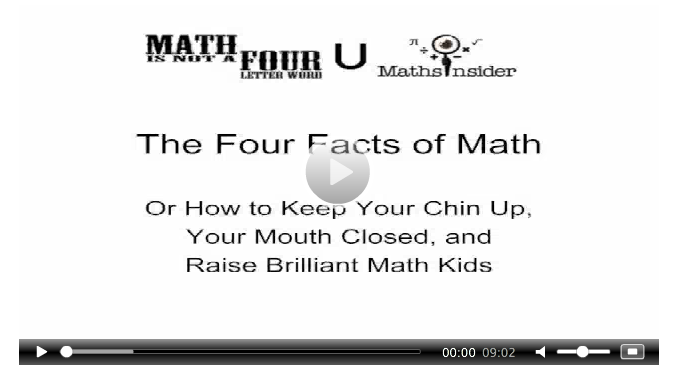 4 Math and me: Children who identify with math get higher scores. Self-talk influences our performance throughout life. Math is no different. Dario Cvencek’s study shows that performance in math tests links to stereotypes. This in turn determines how children think of themselves as math learners. For example, girls who subscribe to the theory that ‘math is for boys’ will tend to have weaker mathematical ability. Researchers measured explicit and subconscious beliefs in children through a range of tests. They then monitored their results in standardised tests at the end of the school year. They found that implicit, subconscious beliefs affected math scores while explicit beliefs did not. 4 Watching the brain do math. Using MRI technology, scientists at Carnegie Mellon University have been able to see what’s happening in the brain while students are solving maths problems. They identified four distinct stages of the thought process: encoding, planning, solving and responding. Using MRI, they analysed how long respondents spent on each stage of the process. Action Point: Professor John Anderson hopes that his research will eventually lead to improvements in classroom instruction. 5 The brain performs feats of math to make sense of the world. The orbitofrontal cortex, just behind the eyes, carries out a constant stream of calculations and computations. All this without us being consciously aware of what’s happening. This process shapes our behaviour and reactions to situations. Using a safari park simulation, researchers from Princeton University demonstrated that people could accurately decide which area of the virtual park a specific group of animals had come from, based on their previous experience in the game. This ability would have been important to our ancestors’ daily survival, and it’s just as crucial for us today. Even those without confidence in their math skills can take heart from the fact that our brains have an innate ability to conduct complex mathematical computations. 6 Finger tracing can lift student performance in math. Getting young children to trace letters and numbers with their fingers is a standard part of early childhood education. Recent research by Dr Paul Ginns suggests that this benefit extends to other areas as well, specifically, solving math problems. A survey of children aged 9-16 in Sydney showed that using the index finger to trace over important elements of algebra and geometry problems helped to improve their skill in solving those problems. Action Point: If you have young children, you probably already encourage them to trace letters and numbers. Try to find ways to maintain that habit as they get older. One suggestion is to let them see you modelling the behaviour as you try to figure out measurements for DIY or craft projects. 7 Improving math in sixth graders. Marije Fagginger Auer’s research shows that “children can benefit from writing down their calculations, especially the more vulnerable group with lower ability”. Current trends lean towards a heavy focus on mental strategies that don’t require children to ‘show their workings’. This research found that a written process of working out the solution resulted in a higher proportion of correct answers, although this took more time. Action Point: The results of this math education research will be used to improve teacher training programmes. Meanwhile, it’s easy to encourage children to write down their process for answering questions. This will work especially well in areas they find more challenging. 8 Math study shows our brains are far more adaptable than we know. This fascinating research shows that blind people have the same innate numerical reasoning abilities as sighted people. It was previously thought that the basic number sense present in humans and animals was related purely to sight. This study found that, in blind people, the visual cortex plays an important role in numerical reasoning. 9 Simple numbers game seems to make kids better at math. 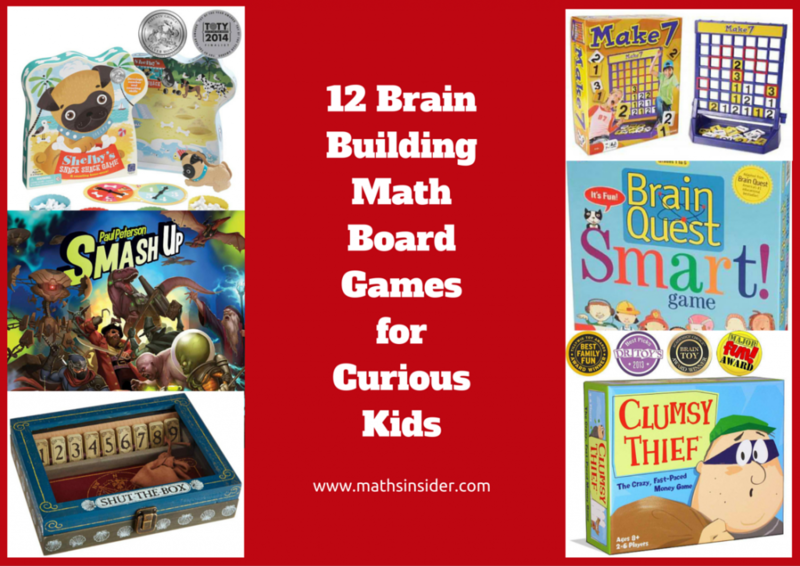 Games are a great way to boost math learning, we know that already. It’s also been known for a while that a highly developed sense of number in infancy can predict later math success. Johns Hopkins University researchers have taken this a step further with a study that suggests that games can bolster an innate sense of mathematical awareness. Children were given a game to play on a tablet, where they had to decide whether there were more blue or yellow spots on the screen at one time. This had to be done quickly, without counting. Testing after the dots game found that those children who played the ‘proper’ version of the game (with questions progressing from easiest to hardest) performed much better. Action Point: This study shows that even a small investment of time can pay dividends. It is well worth adding a few number games and activities to your days. 10 Online gaming can boost school scores. Action Point: One recommendation from this study is that teachers should try to incorporate popular video games into their classes, providing that they’re not violent games. 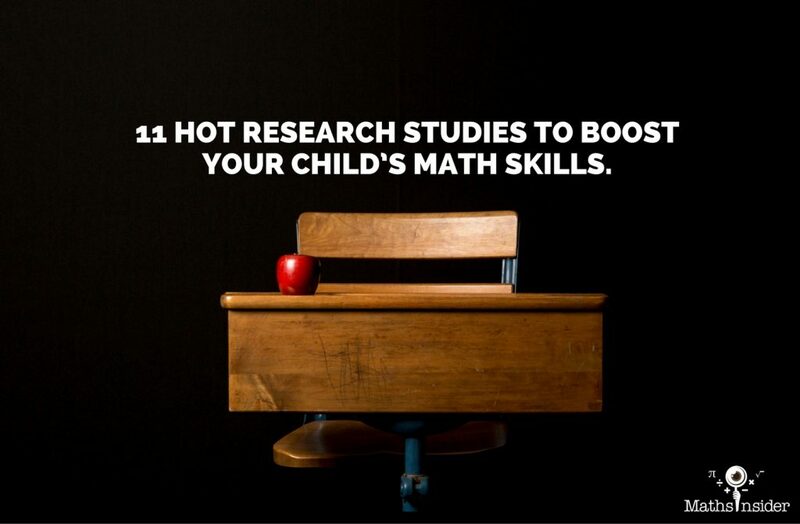 11 Tutoring relieves math anxiety, changes fear circuits in children. This research has found that one-to-one tutoring can not only improve math ability but also treat math anxiety itself. Using fMRI scans on children with high math anxiety, researchers showed that, after an eight-week tutoring programme, the brain’s fear circuits and amygdala were no longer activated by exposure to maths. Action Point: If your child suffers from anxiety around math work, and you’ve been wondering whether a private tutor might help, maybe this is the confirmation you need. It’s interesting to read math education research, especially when it backs up what you already know. 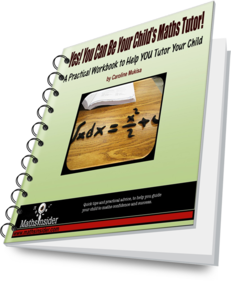 You’ll find plenty of math resources here at Maths Insider to help you encourage your children as they grow their math abilities. I especially love reading research into how very young children learn. It’s fascinating to understand the science behind the things that most of us do instinctively. 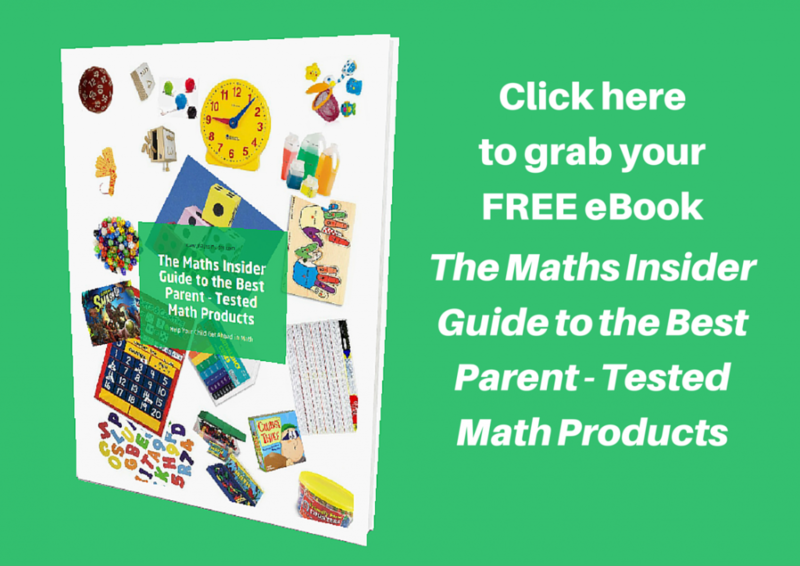 Are you looking for some fantastic books to help boost your child’s love of math? When done poorly, a book about math can be dull and confusing. However, when done well, and accompanied by unique perspectives and colorful illustrations, math books can be fun! The following list of number-crunching books will prove this to even the most dubious of readers. 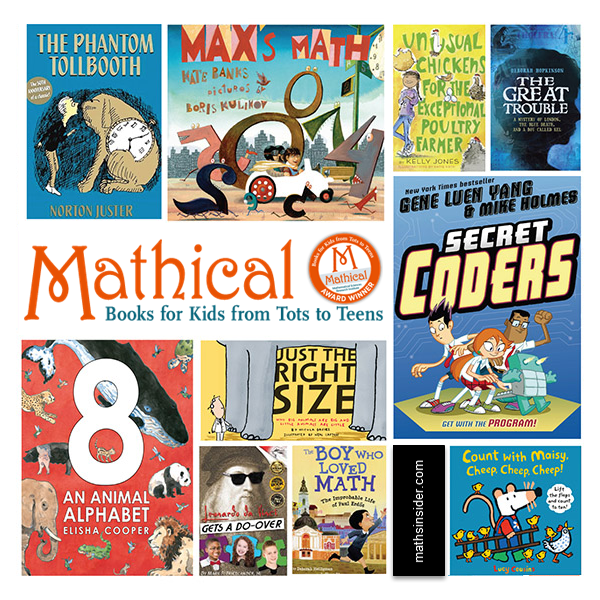 All titles are winners of the 2016 Mathical prize, which honors books that cultivate a love of mathematics in young readers. Using animals to explain math concepts is brilliant, because, which kid doesn’t like animals? 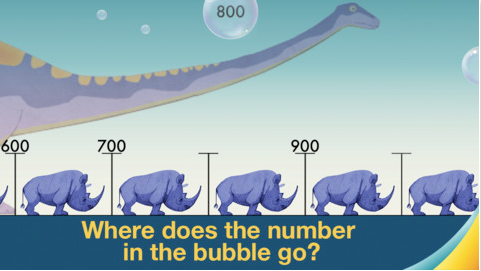 In “Just the Right Size”, the author seeks to amuse children with animal trivia while using these familiar creatures to explain geometry concepts such as size and surface area. Children are drawn to the cartoon characters, and parents enjoy learning new math and science trivia at the same time. 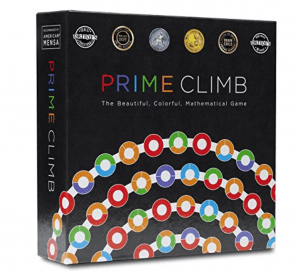 The fun presentation makes it an ideal way to introduce concepts to inquisitive learners and reluctant math students alike. Primarily a historical medical novel, The Great Trouble sneakily introduces math to young readers in the form of money. While following the heroic adventures of the main character, who is struggling to support himself, readers are plunged into the world of economics. A classic book that introduces abstract mathematical concepts, and personifies both math and words as literal characters. The Phantom Tollbooth has delighted readers for over three decades, and continues to pique mathematical interest in readers of all ages. Many parents today describe “The Phantom Tollbooth” as their first favorite book, and enjoy it even more as adults. What better book to share with a child? This preschool book provides a fun reason for counting–they must help Maisy the Dog find all of the baby chickens before bedtime! As a lift-a-flap book, it’s already interactive, and parents can make it more so by using the bright illustrations to teach numbers, colors, and farm animals. Here is a book that offers a modern take on the importance of math. Not only is it a mystery novel filled with old-school learning concepts, such as logic puzzles, it focuses on one of the most progressive uses of math in our world today–computer coding. 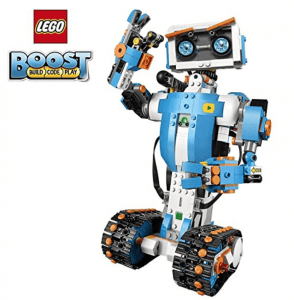 A perfect gift for a child who is into computers or robotics, or who just needs some proof that STEM academics can be fun. Follow Max and his brothers as they set off on an adventure to find Shapesville. Their path is littered with numbers and shapes, and along the way they learn about counting, problem-solving, and basic geometry concepts. The book is wonderful for the story itself, and presents numerous opportunities for parents to introduce new math games (such as finding hidden numbers). A biography of the mathematician Paul Erdos, who was astonishingly brilliant with numbers, yet could not perform simple tasks like making his own bed. This story is for any child (or parent) who sees the world differently and strives to create their own learning environment. The bright illustrations and joyful character can teach young readers that math is not something to be feared, since we see Paul so ecstatically happy about his numerical adventures. That is the prompt that sets the book in action, as a student realizes she is “cursed” by being surrounded by math problems. With the addition of some “silly math” the author also teaches readers that there are some problems that one cannot solve with math. Again, a book that takes math beyond the school room and into real life. Cunningly hidden inside the story of a city girl who moves to the farm and rather reluctantly becomes a chicken farmer, are everyday math problems she must solve. Such as how to calculate the amount of water needed for a certain number of chickens per day, and how to measure for roosting poles. For children who don’t dream of being physicists or engineers, its helpful to show how math is still useful in their own real world lives. Little math problems are just as important to your success, no matter which undertaking you choose. Parents have described this book as funny, diverse, thought-provoking, powerful, and worth reading over-and-over. This is the book to perk up reluctant teen math students. This adventure story links multiple academic subjects together (much as the Master himself did). Follow the three young characters as they help a resurrected da Vinci on his quest to better humanity. Along the way the 3 young characters play the role of both students and teachers to the grand master; an empowering way to show children that what they learn today, they can use for teaching others tomorrow. Is math anxiety really a thing? 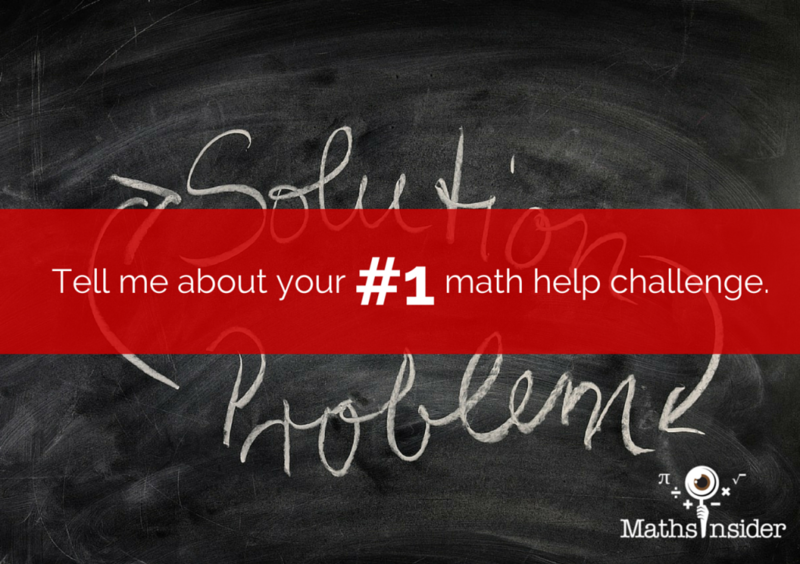 Math anxiety, that is feelings of stress, fear and apprehension when it comes to doing math, is certainly real. In fact scientists have developed different ways to measure mathematical related anxiety including the MARS (Mathematics Anxiety Rating Scale) and the Fennema-Sherman Mathematics Attitudes Scales (FSMAS). A child suffering from math anxiety is not necessarily “bad at math”, but the stress they feel in math class and the avoidance tactics they use to minimize the amount of math they need to do, mean that they often don’t get the much needed practise that leads to math fluency. Fortunately, research has found that, when it comes to math anxiety, parents can offer a great deal of help and support to their children. 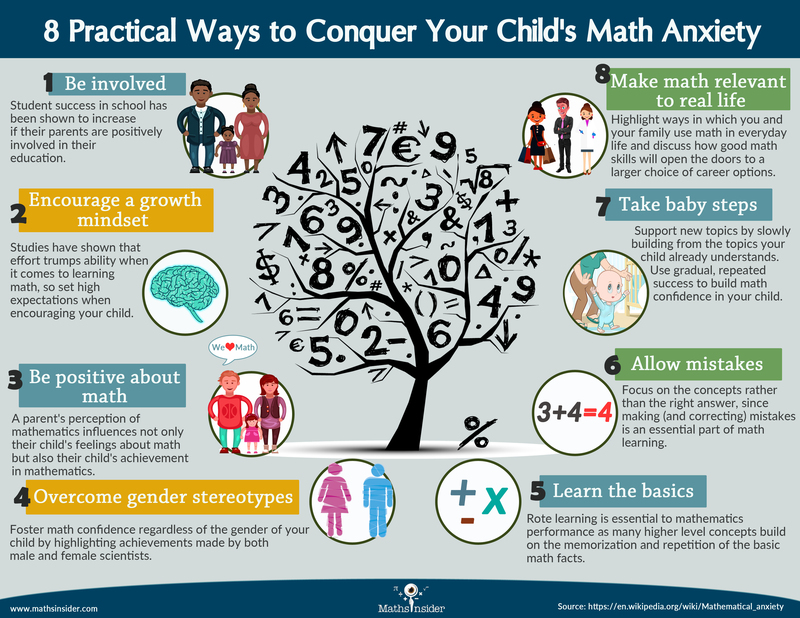 The infographic below gives 8 science-backed, practical ways to help parents conquer their child’s math anxiety. Student success in school has been shown to increase if their parents are positively involved in their education. Studies have shown that effort trumps ability when it comes to learning math, so set high expectations when encouraging your child. A parent’s perception of mathematics influences not only their child’s perception, but also their achievement in mathematics. Foster math confidence regardless of the gender of your child by highlighting achievements made by both male and female scientists. 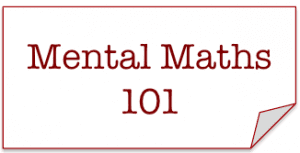 Rote learning is essential to mathematics performance as a many higher level concepts build the memorization and repetition of the basic math facts. Focus on the concepts rather than the right answer since making (and correcting) mistakes is an essential part of math learning. Support new topics by slowly building from the topics your child already understands. 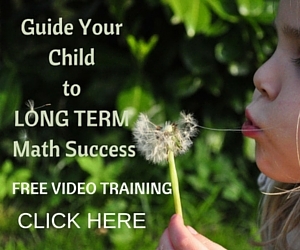 Use gradual, repeated success to build math confidence in your child. 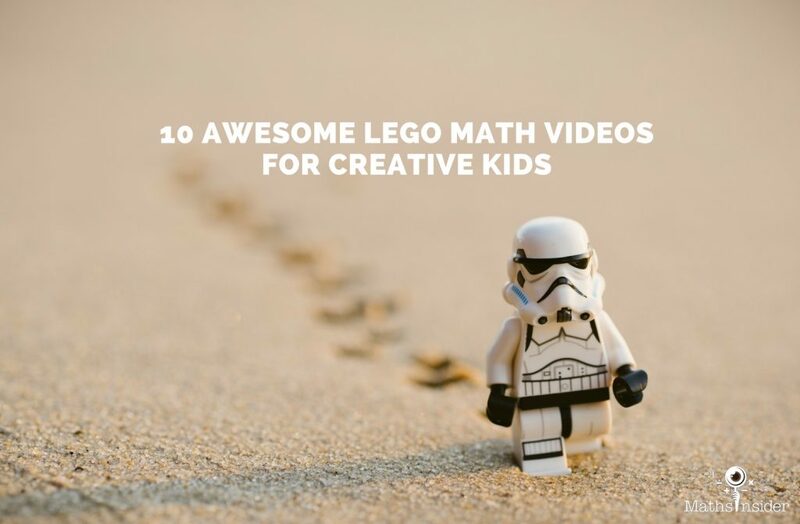 Highlight ways in which you and your family use math in everyday life and discuss how good math skills will open the doors to a larger choice of career options. Please include attribution to www.MathsInsider.com with this graphic. What is Your No. 1 Math Help Challenge ? I’d love to hear how I can help! It’s been several years since I’ve conducted my last survey. It’s a shame and it means I haven’t done all I can to best understand and help you. 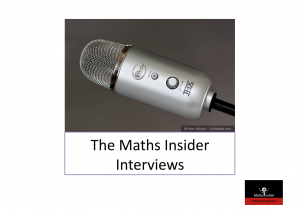 I’m determined, however, to make Maths Insider the best it can be for you, and it all starts with a brand new survey! All answers are collected anonymously and your response will be a primary factor in shaping the future of what I do, what gets published, what the site looks like and ultimately your experience with Maths Insider. I’m really excited, and I hope you’ll give a few minutes of your time to take this incredibly important audience survey. How do do I keep my child motivated on a math program? How can I help with their lack of understanding of the basics? How can I help keep him interested in the homework that is mere repetition of the school lesson. He gets bored and demotivated? 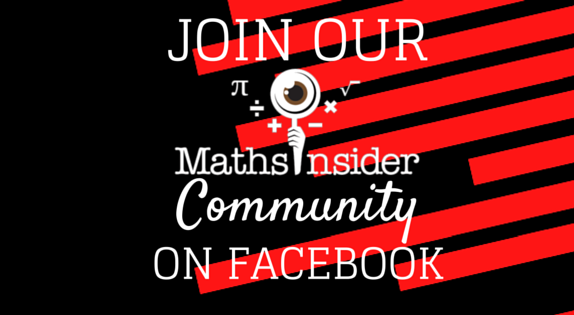 So go ahead and fill the Maths Insider No.1 Challenge survey! Maths. It’s one of those subjects your children either love or hate. For some, getting their head around number patterns, learning their times tables, and mastering long division is just too much to bear. But maths has been considered ‘boring’ for far too long. It’s such a valuable subject, that teaches your children skills for life. Skills they will need to employ almost every day in their adult life. So it’s time to start a revolution. 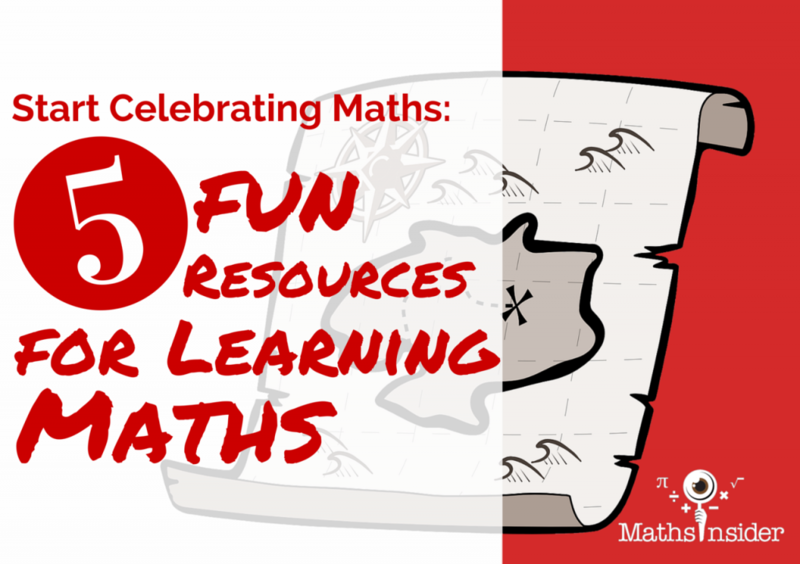 It’s time we started celebrating maths and making it fun. We’re witnessing a technology boom, and children of all ages know their way around an iPhone or iPad better than many adults. 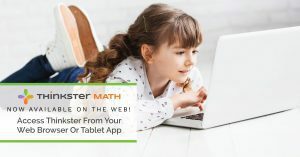 If this sounds like your kids, you should embrace their tech-savvy nature and make maths fun with an app or two. There are plenty of apps for children of all ages and abilities, making this a great aid for many parents. A quick browse of the app store on your mobile or tablet will bring up a plethora of free and paid for apps, designed at teaching different skills. If you’re not sure what you’re looking for though, this post from Maths Insider lists some of the best. If you don’t own a tablet but still want to make the most of these more modern methods, the World Wide Web is by far your biggest ally. There are a whole host of websites and online games designed to make maths fun; many of which, your children won’t even see as learning. Again, do your research and find out the best ones for your child’s age and ability, but you won’t be short on options. 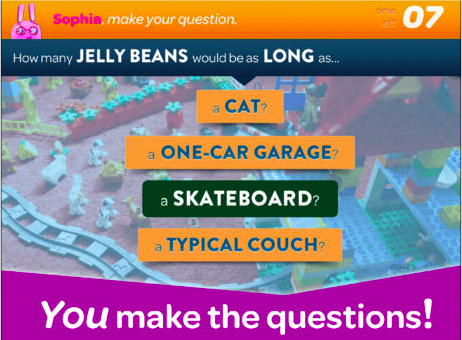 Mashable recently posted their pick of ‘5 Fun Ways to Help Children Learn Maths Online’. You can check that out here for some inspiration and places to start. 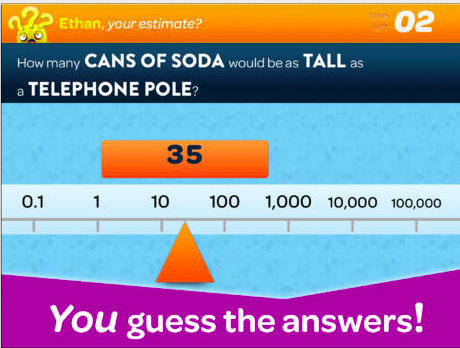 Believe it or not, your kids can get clued up on maths by watching the TV. Children’s television has always had a strong focus on learning, but this has only increased in recent years. Now, your kids can watch some great programmes that are all geared towards making maths – and other subjects – fun and interesting. There are also a number of dedicated revision services and programmes available via your television which can be a great aid for older children. The TV is a great maths teaching aid as it doesn’t really feel like learning, but you’d be surprised at what your children pick up on. Some children learn better by ‘doing’, which is where these more tangible maths aids come in. 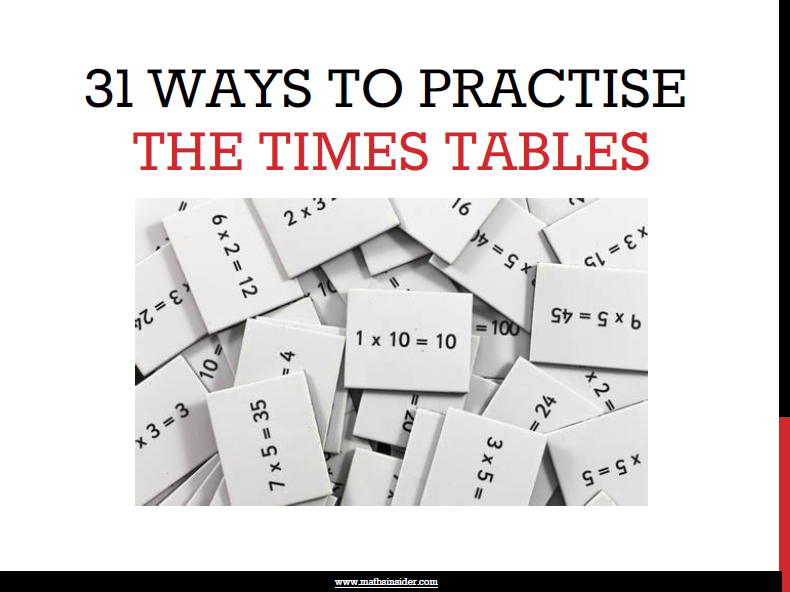 Games like Times Table Snap, Primary Numbers Bingo and Fraction Towers are all great ways you and your children can play and learn together. There is also a lot to be said for ‘playing shop’ with your children. Write a price list for things you can buy from their ‘shop’ and ask them to be shop keeper. Do your shopping and ask them to tally up the amount in their head. You can then get them to work out how much change you’re owned and what coins they could give you. This is fun and something you can do for real if you take your children along when you do the weekly shop. 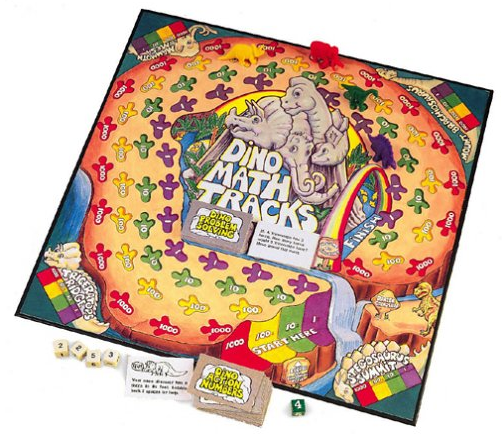 These aids can be brought online or in local toy stores and are a must-have for parents looking to make learning maths more fun. 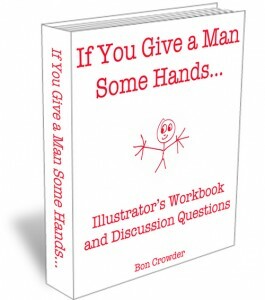 Never underestimate the power – or fun – of a good workbook. Some children will prefer this method of learning as it is similar to how they’re taught at school. You can get loads of work books aimed at different age groups online, and go through them with your little ones. Choose ones with bright colours, loads of images and plenty of variety. If you can work through the more fun games and puzzles, you will be able to foster a love of maths. You should also buy puzzle books like Sudoku’s and other number puzzles for your children. They keep the brain active, and are a great way of learning new skills. 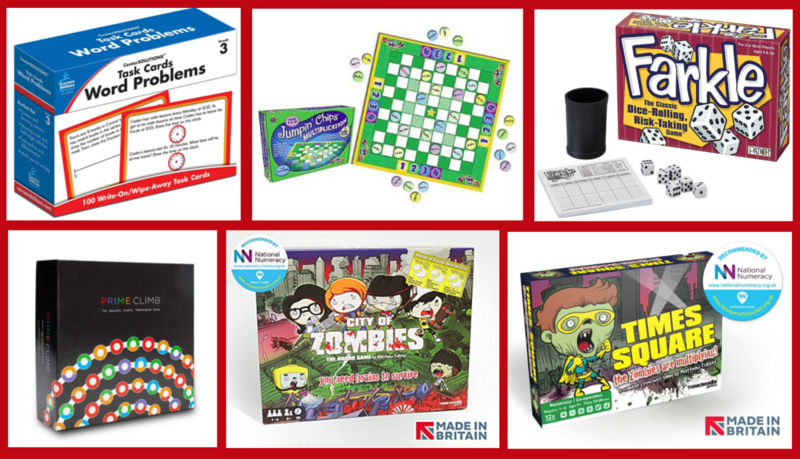 There are plenty of fun resourcess for learning maths that you can purchase for your children, and a whole host of ways you change your kids’ perception of the subject. Sure it can be hard at times, but it is a hugely important subject and one that can be fun when you look at it a new way. Clare Evans is writing on behalf of Core Assets, the largest private agency for fostering in the UK, and recent winner of the Global Diversity Award 2013. 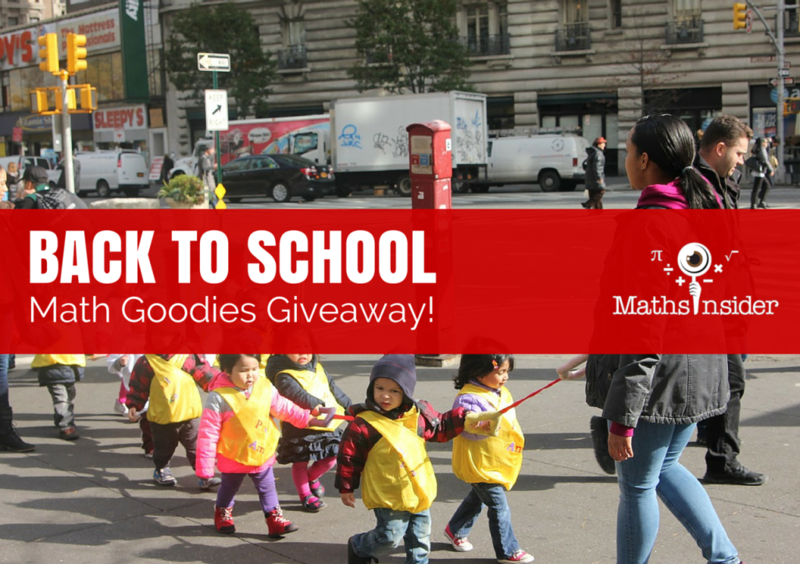 Back to School Math Goodies Giveaway! My 4 kids went back to school this week. I’m glad that we’re back into some sort of a routine, but am wondering how I’m going to survive yet another 9+ months of getting up super early. Whether you’re homeschooling or sending your kids to school, it’s likely that you’re reading the Maths Insider blog to find out how to put some spice in your child’s relationship with math! 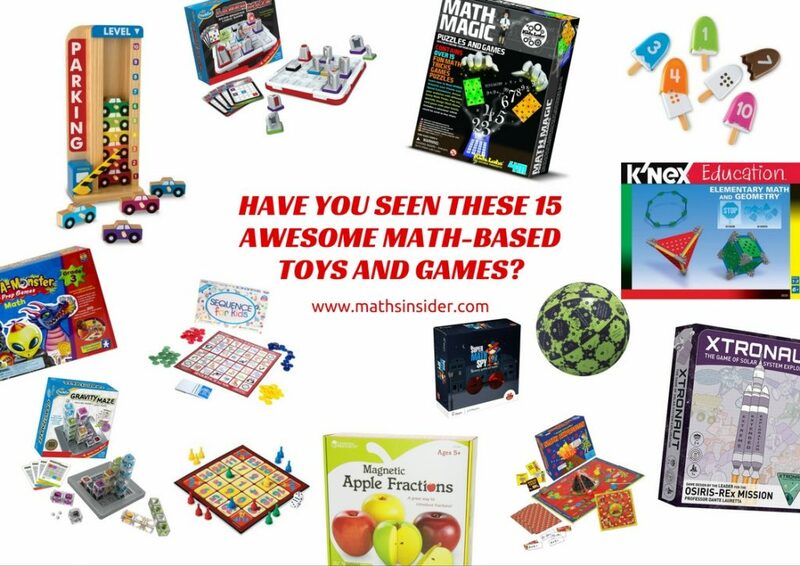 Well as a Back to School gift to you, I’ve got together once again, with Bon Crowder, fellow math blogger extraordinaire, from Math is Not a Four Letter Word to bring you some math inspiration freebies. 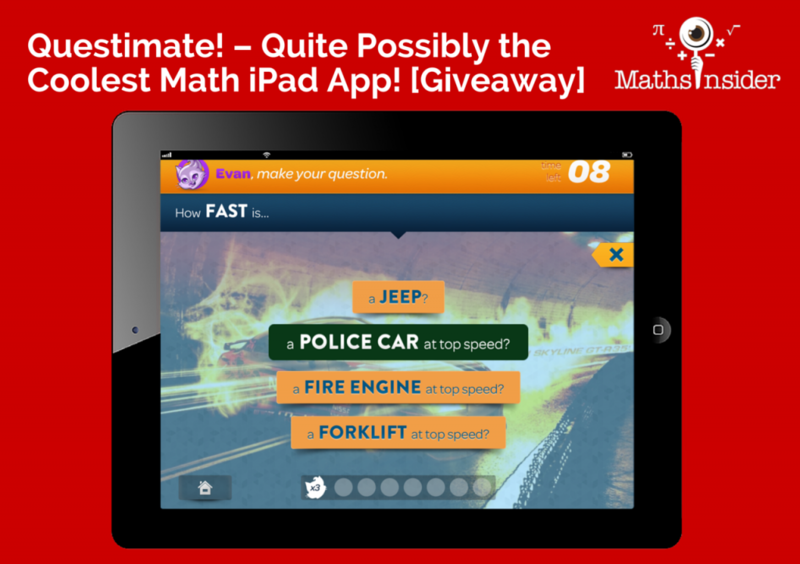 Click through to the Super Math Giveaway website to find out more and to start receiving your free maths gifts! p.s. Don’t forget to like and share this on Facebook and Tweet out this rockin’ offer! p.p.s. 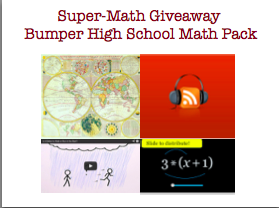 If you’re already signed to Super Math Giveaway from 2 years ago, you’ll get the additional content sent to you. No need to sign up again!